Population… well, you’re here. Then there’s me, Mike Chudy, the creator of Strange-Neighbors. Plus… Oh, all the characters… carry the one, and… Well ok, there’s not a lot of us at the moment, but we’re a growing community! I encourage everyone reading this to check back every week for a new Strange-Neighbors strip. I’ve put that big green banner up there promising a “New Comic Every Wednesday”, so I guess I’ve somewhat painted myself into a corner. Which is good! I’m going to do my damnedest, to keep to this schedule and if my remedial math skills serve me correctly, that means I owe you guys 52 strips. That sounds doable right? …Although, this is a leap year so I hope that doesn’t somehow factor in. Because if for whatever reason, I end up owing you 53 comic strips, then forget it! All bets are off! I mean come on, I’m a man. Not a machine! To be honest with you, this is more of a test for myself than anything else. My thought is; instead of working on my drawing skills by sketching in a sketchbook that will just end up on a shelf in my studio, why not just throw it out there for the entire world to see? This way, we can all look back in a year and say, “Wow. Those early strips really sucked!” Or if you’re a little less of a pessimist than I, you might say something along the lines of, “Wow. 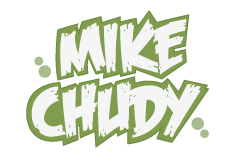 That Mike Chudy. Not only is he incredibly handsome, but also, his skills as both an artist and a writer have really come a long way!”…Right? That sounds like something you would say. Either way, I want to thank you for stopping by, and I encourage you to keep checking back each Wednesday for a (fingers crossed) brand new strip! I’m excited to see what develops with these characters, and I hope you’ll join me for the ride. If you like the comic, let me know by posting some feedback. If you hate it, or have some ideas on how to make the strip better, well… you can take those ideas and shhhov …um …just a …just post them to me. Yeah, that’s it. I’m stubborn, and I probably won’t listen, but I’m really interested to hear what you guys have to say! Thanks again for all the support, and I hope I can count you in as a permanent resident of Strangetown!